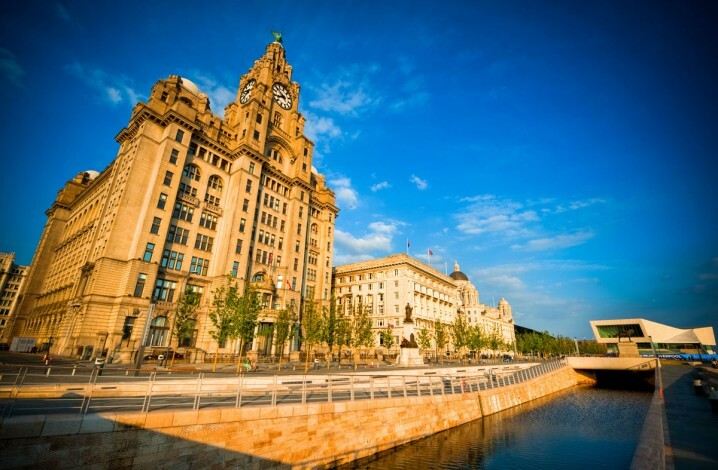 The Pier Head is the focal point of Liverpool’s waterfront and is dominated by a trio of striking buildings collectively known as the Three Graces. It is one of the world’s most famous skylines and is part of the Liverpool Maritime Mercantile City, a UNESCO designated World Heritage Site. The Three Graces are the Royal Liver Building, the Cunard Building, and the Port of Liverpool Building. The Port of Liverpool Building was the first of the Three Graces to be built. It opened in 1907 as the headquarters of the Mersey Docks and Harbour Board. It was designed by Sir Arnold Thornley and FB Hobbs in an Edwardian Baroque style and is noted for its large central dome and ornate detailing. The Royal Liver Building was designed by architect Walter Aubrey Thomas as the headquarters of the Royal Liver Friendly Society. The Grade I listed building opened in 1911 and continues to serve as the company’s head office today. The Gothic skyscraper is topped by two clock towers, each with clock faces measuring 25 feet across, allowing sailors on the Mersey to tell the time from their ships. On top of each clock tower sits a statue of a Liver bird, widely recognised as the symbol of Liverpool. The Cunard Building was the last of the Three Graces to be completed. It opened in 1917 as the headquarters and passenger terminal for the Cunard Steamship Company. It is built in the style of an Italian palace with Greek Revival details. Today its six storeys are home to various public sector organisations and private businesses, while its basement houses Underwater Street, a children’s discovery and play centre. The Museum of Liverpool opened in 2011 and tells the story of Liverpool development to the present day. It’s situated on Mann Island, between the Three Graces and Albert Dock. In 2009 a new 1½ mile extension to the Leeds & Liverpool Canal opened, connecting the canal to the South Docks (Albert Dock, Canning Dock, Salthouse Dock) and passing through Pier Head. 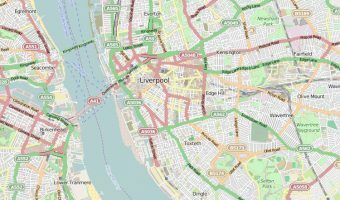 Mersey Ferries have three ferry terminals; Pier Head, Seacombe, and Woodside. On weekday mornings and evenings a direct commuter service runs between Seacombe and Pier Head. The morning service begins at 7.20 am and runs every 20 minutes until 9.50 am, while the evening service begins at 4.15 pm and runs every 30 minutes until 7.15 pm. Mersey Ferries also run River Explorer Cruises up and down the River Mersey, calling at all three ferry terminals. Seacombe ferry terminal boasts the U-boat Story attraction while Woodside offers Spaceport. In the summer months they also operate Manchester Ship Canal Cruises between Liverpool and Salford Quays. For departure times, timetables and ticket information visit the official Mersey Ferries website. Map showing location of Pier Head and the Three Graces.